Sarah Goodall looks after social media for EMEA and she presented on June 26th at the usefulsocialmedia conference in London. “How can social media generate value? I haven’t got all the answers!” Sarah said as an introduction, but she has a few clues which she wanted to share with us. Sarah has worked for small and large companies and knows “how to make things work on a tight budget”. SAP sells software and services to businesses; it is forty years old and it comes from “a traditional marketing background” Sarah said, and moving into social business “is a true cultural shift”. Hence, social media “came as a shock” to SAP according to her and “it helped [them] turnaround the sales cycle” Sarah went on. What it means is that there has been more emphasis on posting content on where customers are getting it rather than push that content over to them. Therefore, the transition is to inbound Marketing “even though we are not there yet” Sarah said, very honestly. “Outbound still represents twice the budget which is spent on inbound marketing” she added. How to attribute social influence to revenue? At the very heart of the business, there is the owned SAP community, using Jive internally and an external community with customers. On top of that, there are channels which aren’t owned by SAP such as LinkedIn, Slideshare, Facebook, Twitter etc. The SAP community network is fairly known outside of SAP, and is 3 million big nowadays. “A lot of bloggers are contributing in this community, most of them aren’t part of SAP by the way” Sarah added. On external platforms, SAP have enough fans to fill in football stadiums several times “but this is still not sufficient for CFOs!” she said. Hard facts are required, more arguments needed. So what will it take to drive the point home? “What the CFO is interested in is the impact on customer value, and the bottom line and it’s tough, I’m not going to lie” Sarah said. Potential cost of R&D saved: if you use the comments and the voting and offset that against the money saved on R&D, this is tremendous. There is also a cost of loyalty and there are savings which can be made. 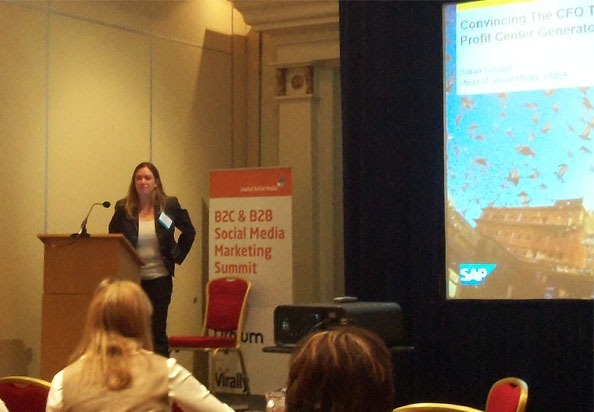 Social commerce: this is a little more tricky because “the SAP sales process doesn’t quite work like that” Sarah said. SAP tried to embed links in LinkedIn and experimented on how Facebook posts can lead to a registration. “It’s not enough to generate revenue” she said “it’s not an exact science but it’s enough to uncover value”. There are also chance engagements, they don’t happen very often, but when a potential customer has been turned into a customer later then it is a great achievement. Social intelligence: “this is a little bit more woolly” Sarah said but you can try and get insights from social media, and it can be shown that click-through-rates can be influenced through social media. Social insight: social media is also useful in order to measure brand health. SAP is monitoring what users are saying about SAP and their competitors. “There aren’t any numbers but it is useful” Sarah said. Sapphirenow: this is the biggest business conference which is organised by SAP. In Orlando, 15% of twitter handles of delegates were identified, and 25% followed the @sapphirenow Twitter handle. “This is still early stage Sarah said but it is very useful to tie to something related to business and prove it’s useful” Sarah said. Social efficiency: social media saves a lot of money on support and reduces significantly the amount of inbound calls SAP is getting for support. SAP mentors are SAP’s brand advocates and “this is media which can’t be paid for” meaning that it is invaluable. SAP also launched a #suithugger hashtag which brought amazing results. As a conclusion, Sarah said that “you would have to “communicate the right metrics to the right audience. Don’t show clicks and followers to CEOs! Show how social media is impacting productivity. You can’t really talk of the ‘ROI of Facebook’” Sarah warned. Pearls of wisdom … does anyone have anything to add to this? I don’t. A few months ago, towards the end of 2011, as I delivered a pitch on social media ROI/ROE at the iStrategy conference in Amsterdam, I asked my team at Orange to put a social media dashboard together, one that would be monthly, more appealing to managers than the weekly slapdash XL fires were produce for ourselves, and yet would be a useful tool for decision-making. Here is – below – its December 2011 version. As I pointed out in my presentation in Amsterdam, this dashboard is in work-in-progress mode, and will always be. It is not meant to be used to show that we are stronger, better or unduly proud of ourselves but on the contrary, that we aim at doing well and getting better. to Klout or not to Klout? A lot of the metrics in this dashboard are here, for want of a better purpose, to underline that new metrics are needed. Sometimes, these metrics merely require fine tuning. Klout for instance, has been heavily criticised, including by myself. We aim to use Edelman’s Tweetlevel as a replacement very soon, because of the level of noise and fuzziness around the Klout measure, and because nonetheless we need some kind of measurement. Edelman provides this, without the hype. engagement rates … what are we measuring here? As to engagement rates, this is yet another kettle of fish. We realised, in the course of our comparisons, that we were being penalised by social bakers for the wrong reasons. For instance, our account was filed as a British account (vs. global) which was penalising us. Secondly, we use polls a lot and they are supposedly not considered as part of the engagement rates by the system. Yet, we have found repeatedly that polls are a very valid way of engaging with our community and we have no intention to suppress them. Last but not least, our account is multilingual and multinational. This is perfectly normal for a company which is operating globally, that is to say in 35 countries from the B2C perspective, and 220 countries and territories from the B2B point of view. Whereas many of our competitors are not that global and therefore enjoy a much better engagement rate which is not justified, we actually choose to speak Polish to the Poles, Spanish to the Spaniards and French to the French-speaking audiences of Africa and other countries as well as English to everybody else, and to us this is perfectly normal ; yet, we are being penalised for this by social bakers. note: no hard feelings against social bakers I think this is a very good tool, and a great company. I’m a happy customer. I am only aiming at improving the system/measure. We are trying to work with them in order to correct this measurement, but might also introduce our own calculation in which we will introduce a new way of measuring engagement rates in order to correct this bias. What we’re trying to prove here is not that measuring return on engagement and social media isn’t worth doing, on the contrary, but that there is a lot in our plates in order to correct all these numbers and systems, before we can rely on these numbers and move forward. As announced in a previous post, I was a keynote at the iStrategy conference in Amsterdam on Oct. 26. Beside the short video clip which I have recorded with my team in order to introduce the keynote, I have also prepared a fully fledged slidecast on slideshare. The package also includes a downloadable version of my dashboard at Orange. take all this with a pinch of salt as the goalposts keep moving and we need to adjust constantly (the “Klout” index for instance keeps shifting. The slidecast for this presentation was recorded on the day before the iStrategy presentation which took place in Amsterdam on October 26th. It is therefore slightly longer than the actual presentation which lasted only 35 minutes (this slidecasts lasts for 45 minutes). Due to a bug in Slideshare, I wasn’t able to synchronise the sound and slides properly but you can download the presentation and change the slides manually while listening to the audio. There is a sister presentation to this one, i.e. the social media dashboard which I will let everyone download too. This Dashboard is a version of our Orange Social Media monitoring panel as of mid October. P¨lease note that it was issued on the eve of a major change of the Klout score algorithm and that therefore I am not certain that I will not replace this metric with another more reliable one. This dashboard is an attempt at making sense and putting numbers behind our social media engagement and presence, it is no way comprehensive and it is not meant to achieve anything else than help us hone our skills and improve engagement with our audiences. Note: this is the monthly dashboard and doesn’t include the more in-depth analysis which is being produced by the team on a weekly basis. As the question was asked, the data source is either socialbakers or Twitter counter, or Tweetreach, or even Google Analytics for the most part. The data is crunched into Exel and then injected through Adobe Indesign. The initial design was done by a graphic artist and the maintenance is done in my team. The job of maintaining this dashboard is a couple of hours per month and should not be more than this. Selling Corporate Blogging To Your Boss? Don’t Mention ROI! One is often told that getting the buy-in for a Social Media initiative requires some solid ROI calculation. One would have to weigh the pros and cons, how much it costs, try and evaluate the effort which is required, measure it and translate it into pounds, shillings and pence. And profit should also come into play, since it is deemed inappropriate for a new project to be set up without a clear definition of how much revenue it brings. It is indeed a well known fact of Corporate culture that no IT project has ever been implemented without delivering great benefits… well, maybe not. And another well known fact is that, similarly, all systems which have led to losses in productivity should be banned… well, maybe not either. Let’s take email as an example. We have already described at length the pitfalls in which many corporate email users are falling and how to preserve your productivity and lifestyle by better using email. Yet, email is also responsible for stress, and waste of time and money and effort. On average, Managers spend 40% of their time doing email according to the authors of the Hamster Revolution. I’m not mentioning examples of those who spend 100% of their time on this but I know a few who do. Yet, despite all these productivity issues, the requirement for email is not questioned, barring a few exceptions such as IBM’s 2.0 expert Luis Suarez who declared war on e-mail and almost succeeded (lucky him!). So is ROI a valid way of showing how useful Social Media can be? One doesn’t engage in a Social Media project because it brings profit but because it enables one to do things in different ways and that these ways – listening, adapting, innovation – are beneficial to the brand, to your ecosystem, your image, and above all, the well-being of your clients, partners etc. Eventually, my prime advice to those who’d like to spread the word about how Social Media can help a brand engage in passionate discussions would be to suggest to them that they speak to their boss about it and ask him/her to write things for the company blog. I did this and guess what: I never had the ROI question anymore because he understood immediately that he too could spread the word across about his own pet subject (Green IT) and that was – as he himself admitted – invaluable. Maybe the final reason for not falling into the ROI trap is that ROI is often used by execs to get rid of subjects they don’t like even though there may be no other rational reasons for them to do so.